Finally! 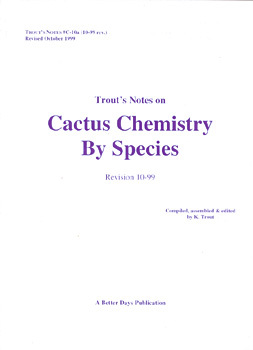 A book that provides a meaningful summary of the published cactus chemistry. Complete with detailed references, reported concentrations (if available), notes on errors appearing in the literature, reports of human bioassays (previously published and unpublished), and suggestions for future assays. Invaluable for researchers and cactophiles, professionals and amateurs alike, this book should not be regarded as the final word on cactus chemistry but rather as the first place to start in writing the new chapter of analytical exploration that begins today. "As always, thorough, well done, and filled with treasures..."
"...very useful and up to-date..."